UPDATE: Web version available now too! 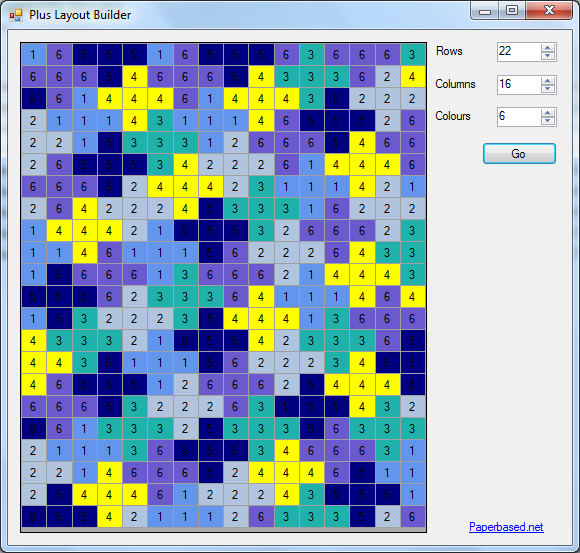 Plus Layout Builder Web Version. After four frustrating days battling a bad headache it finally lifted today and left me with a yearning to cut some code. I’d been playing around with an idea for a new crochet afghan. I wanted it to be solid colour granny squares laid out in an interlocking plus or cross pattern. The hassle was working out a suitably random layout. And so this little app was born. It’s super simple. Just put in the number of rows and columns required (maximum of 40 rows and 30 columns) and how many colours you’d like to use (minimum of 5, maximum of 15). Hit the Go button and it will generate a random layout for you. This version is very very very very very basic. Just enough to generate the layout. There’s no way to save a layout, or print at present – although you can take a screen capture when you come across a layout you like. Download the Plus Layout Builder zip file here – Windows application, tested on Windows 7 Pro 64-bit. UPDATE: Web version available now too, and you can print your layout directly from the webpage (you might need to fiddle with the print dialog settings to show background images so that it will print the colours, otherwise you get a nice b&w numbered grid). Check it out here: Plus Layout Builder Web Version. App is provided as-is for personal use only. Please don’t link directly to the download file, link to this webpage instead. And please don’t download to sell or distribute elsewhere. This entry was posted in Downloads, General and tagged Crochet, Design, Quilts, Software by Sammie. Bookmark the permalink.